This weekend has been busy with birthday parties and other types of events, and we have been experiencing a hot and sunny weather in the Bay Area so when I see a ray of sun, I cannot help and be outside…which usually means quick dishes, nonetheless savory, one cannot be neglected to the expenses of the other. I like to serve this as a small dish, I call it salad but can be called tapas as well. I have a little weakness for smoke trout but any smoke fish will work as well. In France you can find a large variety of smoked fishes in the supermarket, usually in the packaged fish specialty area of the supermarket. It’s either cooked and smoke or raw and smoked. Smoke trout is easy to find in the US but always saw this cooked version. Every year when I go home, there always a bunch of new products to discover and try out. Another wonderful use of fromage blanc here, where the smoke flavor of the fish combined with creamy fromage blanc, faisselle (I don’t think it’s available in the US), or any other kind of fresh cheese, makes a perfectly balanced combination. The smoke flavor which can be sometimes strong is toned down by the creaminess and softness of the fromage blanc. Sprinkle rock salt on cucumber to drain them from their water. Let it sit for about 30 minutes. Rinse and remove squeeze extra water. In a bowl combine fromage blanc with herbs, mustard, lemon juice and pepper. Mix well and add to the cucumbers. 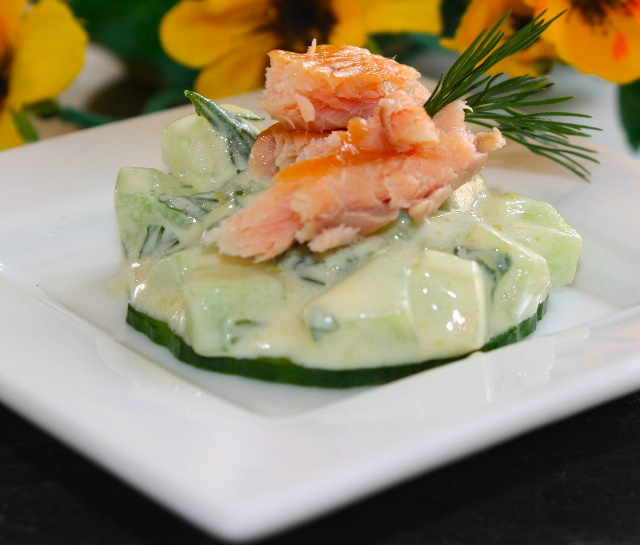 Place a slice of cucumber in a small plate, add one or two tbs of cucumber mixture on top and finish withsome smoke trout. Decorate with fresh herbs and serve. This entry was posted by silvia on May 3, 2010 at 9:16 am, and is filed under Appetizers, Fish/Seafood, Salads. Follow any responses to this post through RSS 2.0.You can leave a response or trackback from your own site. French fromage blanc, usually Polish-style curd cheese is added (it has more acid taste and thicker texture). Smoked trout (and other smoked fish) are popular here, and the dill and chives are traditional garnishing (less than mint).In spring, people add crispy radishes as well. I like this sort of food especially for breakfast in summertime, because it is refreshing (and, as Polish, I prefer salty breakfasts). Yours looks very tasty. This looks delcious, the softness and the texture just come alive…. love smoked fish, but never had it look as good as this before wow! A lovely light salad or first course! And a brilliant photograph as well. I know how to make fromage blanc, but have never tried it. Up until now, I have substituted Greek yogurt when fromage blanc is called for. Will that work here? Smoked trout is one of my favorite types of smoked fish – the texture is so delicate and the flavor pleasing. What a lovely way to highlight it! Another fabulous use of fromage blanc. Love the herbs interplay with the smoked fish. Prefect dish for the super hot Miami days. Magnifique! And definitely call it tapas, it’s more fun than salad!! oh my goodness — so elegant! And such a fresh and beautiful way to present these ingredients! Ooooh…this looks very tempting. I love that creamy look and I love trout too. I usually buy fresh rainbow trout and grill it. But I would love to try this. Beautiful presentation. Silvia, where’s my friend….your birdie? I miss her. Hope to see her photo again Don’t you celebrate her birthday? I am totally wanting fresh and “green” kinds of foods right now too, this is perfect for that sort of craving! I make a smoked trout in endive spears, very similar, and I do a tuna tartare on cucumber rounds. I love this refreshing appetizer! this looks wonderful, such a light and refreshing dish. Love this dish. I will call it a tapas. Great for parties. I am sure it will be a hit. very elegant dish,i like smoke trout.here ,in the mountains,smoke trout is kept into the conifers sprigs,like a little fan,it’s so flavoured! This is an excellent party appetizer, so elegant! Great recipe with fromage blanc! What a beautiful appetizer. Fantastic presentation!